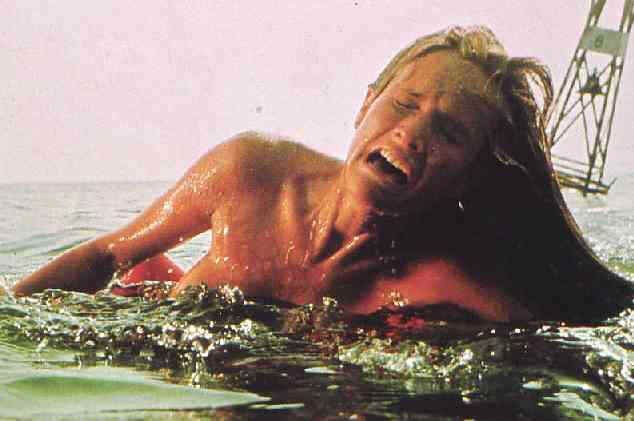 Simplicity can be so shearingly effective that it is easy to become a movie purist after seeing a film like Jaws. There is a big, nasty shark in the water, and a man (‘Brody’, played by Roy Scheider) must protect his family and then go kill the shark. Throw in two memorable supporting characters (Richard Dreyfuss’s ‘Hooper’ and Robert Shaw’s ‘Quint’) and you’ve got movie thriller gold. The movie famously doesn’t show the shark more than a handful of times, and even then not until we are well into the story. Instead, Spielberg uses point-of-view camera, John Williams’ equally famous music and props like picture books showing shark-bite victims to build tension and elicit the appropriate amount of terror. I sometimes wonder if Spielberg would have become a truly amazing director if he had been stuck dealing with low-budget productions like Jaws. I suppose an imagination like his inevitably leads to massive production costs, but seldom since 1975 has he been as cinematically inventive without the bloated silliness that accompanies “size and style” operations (like Jurassic Park, Amistad, Saving Private Ryan, Minority Report, A.I., etc.). On the boat to kill the great white shark are three oddly matched men, the city slicker, the scientist and the gritty old seaman. What is so nice about their personality clashes is that they are quick, natural interactions, balanced with equally quick, mature returns to practicality. All three men have their value and their limitations, yet they never allow their personal squabbles distract them for too long from their main purpose: killing the shark. Spielberg knew we aren’t all that interested in getting to know much more about the characters. Their superficial personalities are entertaining enough, but, like the men, we are never distracted too long from the presence of the shark. Spielberg uses our primal fears – of the unknown, the alien – against us and it works beautifully. Quint even describes the shark’s eyes as black and lifeless: it doesn’t even seem to be alive until it bites into you. The shark cannot be reasoned with, cannot be figured out; it is death. Once all of these things have been established, we might as well be the 4th of July vacationers avoiding the ocean. You don’t need to see a shark to shiver at the thought. This entry was posted on July 15, 2010 by Ian Kay. It was filed under Jaws (1975) and was tagged with jaws, spielberg.